or cold.... and with raw organic cream of course because this is Normandie home of apples and La vache Normande. The stories surrounding the origins of this dessert are many and various but this is my favourite because it's simple and rings very true to me as a cook. The Hôtel Tatin is situated in the commune of Lamotte-Beuvron in what is now the Department of Loir et Cher and lies in the very heart of the Loire Valley. In the late 1800s it was run by two sisters Stéphanie and Caroline and even then (pre Tarte Tatin) it was a busy place famed for its cuisine. Furthermore, at certain periods of the year, namely in the Hunting Season it would become particularly chaotic, proof positive of the similie; as hungry as hunters, with every client clambering for his dinner. On one such occasion, Stéphanie, the cook, leaving a large pan of apples unattended on the top of the stove, went to help out in the restaurant. When she returned, the apples had browned... somewhat and she was about to throw them away when her older and more frugal sister, Caroline said: "Stick some pastry on top and they will never notice", or words to that effect. The taste of the caramelised apples was greatly appreciated by the hunters and for an added effect the tart was later served reversed, being flipped over when it came out of the oven. The dessert became so recherché, the story goes that Maxim's of Paris sent a chef disguised as a gardener to the Hôtel Tatin. He presumably succeeded in his mission because in 1925 it became a feature on their menu. Whether true or not, these are the stories that make a good cookery book a great read and not, as the uninitiated believe, merely a factual list of ingredients and cooking methods. The accolade was truly achieved for Tarte Tatin when it received a status, even beyond that of those collective classics, the Soufflé and Charlotte, with the creation of its own specific dish. A Tatin tin is a metal pan which can be used both on the stove top to cook the apples and then, with the pastry atop, can be directly transferred to the oven. I don't own one of these, I caramelise my apples in a frying pan and then finish them off in a buttered china dish. One thing about this tart though, that makes it even more interesting, is that however many times I make it, it is never the same. 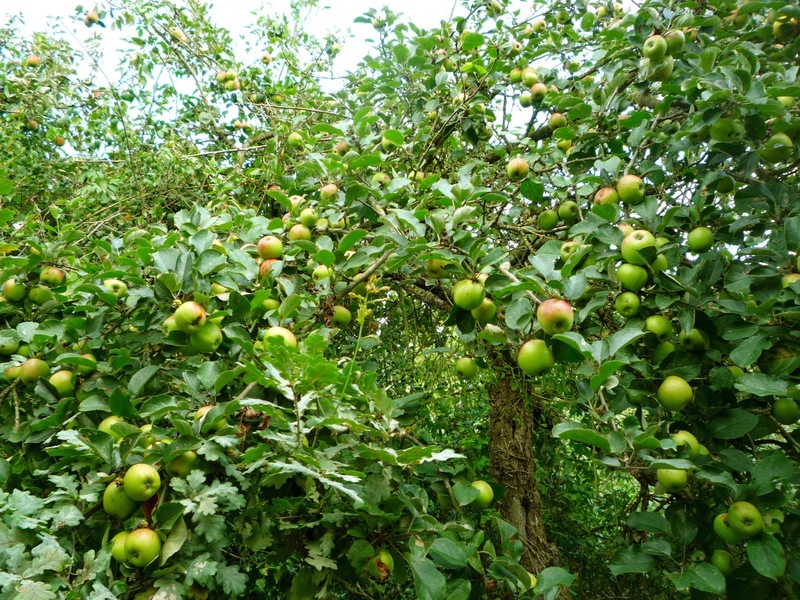 It depends on the apple varieties and texture, how ripe they are, if you peel them, how you cut them and even the ambient temperature and rainfall whilst they were growing. There is no set fixed cooking time for the apples, you really have to go by feel and by the colour of the caramel. That said there are some rules I try to stick to and you'll find them below. Apples - enough to cover the bottom of a large frying pan. The apples shown right, for example, were enough for a 25cm or 10" square, pie dish with an internal depth of 25mm or 1". I included a quince which had fallen that morning. Apple Varieties I tend to avoid adding any that are too 'woolly', as these tend to turn to mush too quickly and the object of the pre-cooking, apart from caramelisation, is to drive enough water off the apples to make for a crisp, flavour and pastry. So, if you have the above in your windfalls then it's best to either put them aside or if you have enough, make a separate tart just from them. This will give you enough pastry to decorate. I like to do this and then flip individual slices of the tart once I have brought it to the table. It allows you to be artistic and is a lot safer! I usually peel the windfalls and keep the skin on the picked apples. I then quarter and core them, allowing some larger pieces to create a mixed texture in the final tart which I find gives and added dimension. Sprinkle the sugar on the base of the frying pan and fleck with pieces of butter. Arrange the apples on the top in a vaguely cartwheel pattern, this looks pretty and also allows for maximum fruit and a good caramelisation. Place on a hot stove top and forget about it for approximately 15 minutes. Check for firmness of the apples by pressing lightly on the smallest pieces with the finger tip. (see above). If the piece of apple gives to the touch the tart is ready for the next stage. You should also be noticing an amount of water vapour being driven from the apples. And you should be looking for and smelling, a delicious golden caramel forming in the base. Unless you are lucky enough to own a Tatin tin, you can now slide your apples carefully into your buttered baking dish, so as to keep the caramelised side on the bottom. You can then make the pastry, this allows time for the apples to cool slightly so as not to 'melt' the crust. Rub the butter and flour to a breadcrumb texture, mix in the sugar and add the egg. Knead ingredients together quickly with the hands and add as much of the water as needed to make a stiff dough. Don't overwork, this is a short pastry and will break if it has too much contact time! Roll out swiftly with a minimum of flour on the board and pin, just enough to stop it sticking. Short pastry requires minimum work and handling, having cold hands helps! Place over the apples tucking the edges down into the dish. Decorate with excess pastry. Any cracks will let out the steam and large ones can be disguised with leaves! The tart is ready when the pastry top begins to turn golden brown. Like many of the other recipes I've posted here, this tart has plenty of scope for variations. You can make it with other fruit, such as pears or apricots and in a savoury version with any vegetable that tastes good caramelised, such as tomato, onion and endive. For us though it's an original apple Tatin, which heralds the start of the colder weather and makes the best of the windfalls. It cheers us through the Winter with those delicious stored fruits, even to the very last wrinkly ones that usher in the Spring. mmmmmmm that would be a great christmas treat! Hi ClimbTheIvy - Thank-you for your comment, much appreciated. 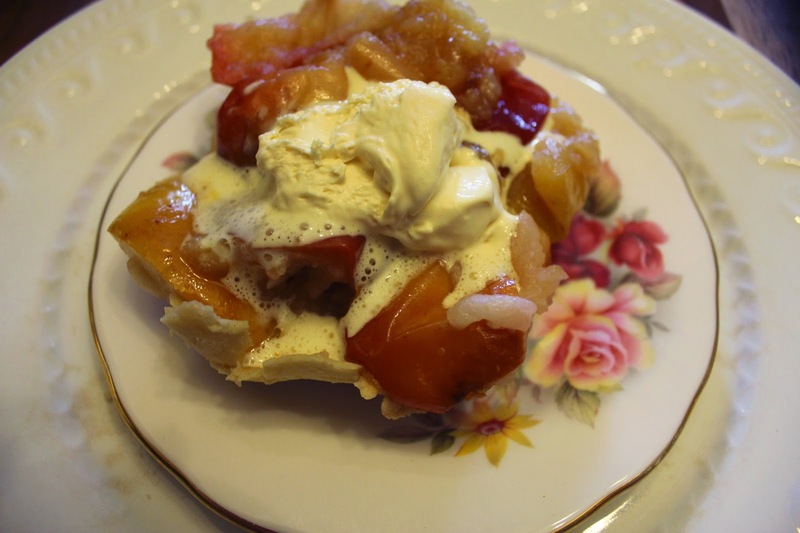 It would make a great Christmas or Birthday treat - I do hope you get to taste a tarte Tatin, very soon! All the best, Sue.